The study involved four major activities to estimate the current market size for more electric aircraft products. Exhaustive secondary research was done to collect information on market, peer market and parent market. The next step was to validate these findings, assumptions, and sizing with industry experts across value chain through primary research. Both top-down and bottom-up approaches were employed to estimate the complete market size. Thereafter market breakdown and data triangulation was used to estimate the market size of segments and subsegments. In the secondary research process, various secondary sources such as Hoovers, Bloomberg BusinessWeek, and Dun & Bradstreet have been referred to, so as to identify and collect information for this study. These secondary sources included annual reports, press releases & investor presentations of companies, white papers, certified publications, articles by recognized authors, gold standard & silver standard websites, food safety organizations, regulatory bodies, trade directories, and databases. After arriving at the overall market size—using the market size estimation processes as explained above—the market was split into several segments and subsegments. In order to complete the overall market engineering process and arrive at the exact statistics of each market segment and subsegments, the data triangulation and market breakdown procedures were employed, wherever applicable. The data was triangulated by studying various factors and trends from both, the demand and supply sides, in the application, technology and platform. Safran SA (France), Rolls Royce (US), Raytheon Company (US), and Honeywell International, Inc., among others. Key players operating in the more electric aircraft market include United Technologies Corporation (US), Thales Group (France), Zodiac Aerospace SA (France), and Honeywell International, Inc. (US). Firms, such as Airbus (France), Boeing (US), Lockheed Martin (US), and Bombardier Inc. (Canada). Total 10 major players covered. This research report categorizes the more electric aircraft market based on application, platform, technology and region. Further breakdown of the Rest of Europe more electric aircraft products market into Norway, and Denmark. The market more electric aircraft is expected to grow from USD 7.68 billion in 2018 to USD 10.94 billion by 2021, at a Compound Annual Growth Rate (CAGR) of 7.33% during the forecast period. Optimized aircraft performance, reduced operating & maintenance cost, and increase in aircraft deliveries are some of the drivers for the more electric aircraft market across the world. China, India, Brazil, and Russia are the key countries expected to witness an increase in demand for more electric aircraft. By Technology, power electronics segment is expected to be the largest contributor in the more electric aircraft market during the forecast period. Currently, more electric aircraft are using electrical energy to power all crucial aircraft components including flight control actuation, environmental control system, utility function, and cabin pressurization, and among others which was formerly controlled by hydraulic and pneumatic means. Moreover, more electric architecture in aircraft helps in improving both generator (mechanical to electric) and actuators (electric to mechanical) energy conversion and enables energy regeneration. For instance, Boeing has featured its B787 aircraft with modern power electronics which will increase reliability, reduce costs, and improve aircraft performance. Power Generation Management application segment accounts for largest market size during forecast period. 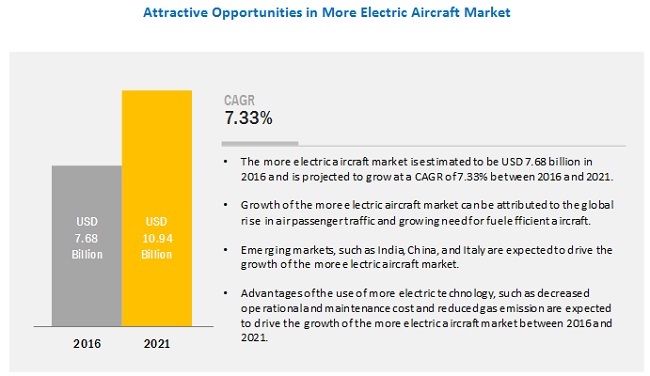 This segment is estimated to account for the largest share of the more electric aircraft market in 2016, due to increase in more electric architecture in aircraft and the growing need for energy requirement. The increasing need for aircraft systems which are lightweight, fuel efficient, durable (to withstand severe climatic conditions), and requiring less maintenance schedules with short turnaround time has led to the increase in demand for more electric aircraft with better power generation management systems. North America is the major revenue generating region in the global more electric aircraft market. Economic growth and expansion of commercial as well as defense aviation are factors driving the North American more electric aircraft market. Growth of the market in North America is also attributed to the rise in delivery of fuel-efficient aircraft and the huge investment by OEMs (original equipment manufacturers) and OCMs (original component manufacturers) present in the region, in research and development. Major vendors in the global more electric aircraft market, are Safran SA (France), Rolls Royce (US), Raytheon Company (US), and Honeywell International, Inc., among others. 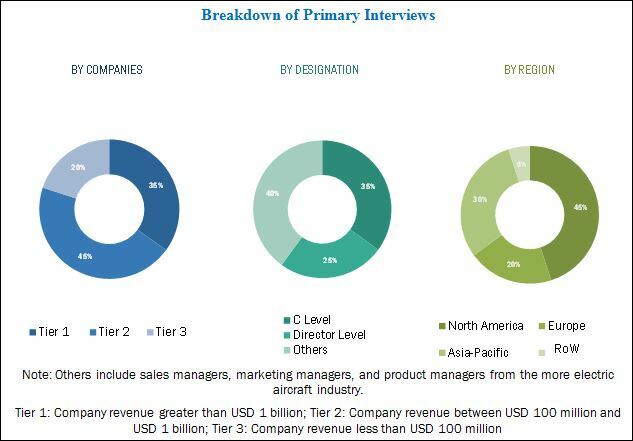 Key players operating in the more electric aircraft market include United Technologies Corporation (US), Thales Group (France), Zodiac Aerospace SA (France), and Honeywell International, Inc. (US). Firms, such as Airbus (France), Boeing (US), Lockheed Martin (US), and Bombardier Inc. (Canada). In August 2016, Safran Electrical & Power, a subsidiary of Safran SA, has received a contract from Airbus to upgrade all data loading systems for the avionics suites on its A320 family of commercial jets (including A319, A320, A320 NEO, and A321). In July 2016, Boeing and Malaysia Airlines Berhad have signed a contract worth USD 2.75 billion. Under this contract, Boeing will supply 25 737 Max 8 airplanes to Malaysia Airlines. In April 2016, Airbus Group and Siemens have signed a contract, under which both the companies will work together in the field of hybrid electric propulsion.